This traditional fish fumet recipe takes considerably more time than our quick fish fumet recipe. However, it uses different ingredients for a more prounounced flavor without the citrus elements found in the quick recipe, is more versatile, and is a better choice for fortifying. Fish fumet can be used as a poaching broth, soup base, sauce ingredient, or as a building block in any other recipe where you’d like to replace water or a different variety of stock to impart seafood flavor. Fish fumet freezes well, so you can make it well ahead of time and throw it in your freezer for later use. Because fish fumet is a stock, we recommend reading The Cardinal Rules of Stock Making if you haven’t made stock before. 1. 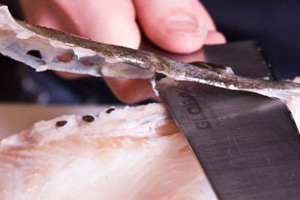 Trim the skin and any fins off of your fish bones. 2. Soak the bones in cold water overnight (12 hours), changing water as needed, to extract any blood and other impurities. This will result in a clearer finished fumet. 3. Drain the water from the bones and slice them into two inch sections. 4. In a large pot, heat some of the oil and sweat the vegetables. 5. Add the white wine and let simmer for 5 minutes (until you can’t smell any alcohol). 6. When you can only smell vegetables, add the bones and cover the pot to let them steam for a few minutes (until the flesh is opaque). 7. Top the bones with 2 ½ quarts of cold water. Add the peppercorns and bay leaves. Bring the water to a simmer and simmer for 30 minutes, skimming occasionally. 8. Turn off the heat, and let the fumet settle. 9. Use a ladle to save the clearer top layer of the fumet from the pot while leaving all the bits, bones, and other undesirables in the bottom. Pour this reserved clear fumet through a fine mesh strainer or chinois (ideally lined with cheesecloth). The goal is to leave as many impurities behind as possible. 10. Use your fish fumet immediately in another recipe, fortify it (shellfish fortified fish fumet recipe), or rapidly chill it for storage in your refrigerator or freezer. Thanks so much for your wonderfully comprehensive stock instruction, especially this fish preparation. I really appreciate the fish selection suggestions and prep photos. Both make this delectable building block much more approachable for a novice fish butcher.